Home-based jobs are attractive to people who are looking to supplement their regular or retirement income, those who want part-time employment, or those who want to save money on child care or gas. Many people have dreams of being entrepreneurs and working independently of traditional businesses. Cybercrooks take advantage of this to create fake offers for work-from-home opportunities. Sharp-eyed avast! 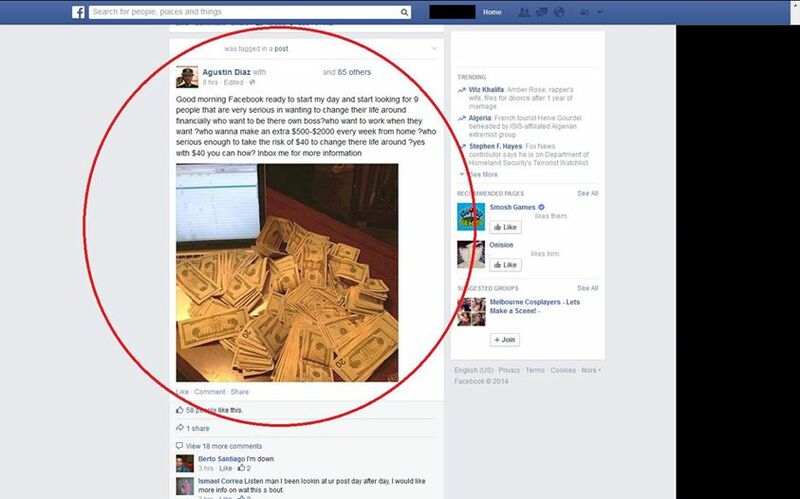 Facebook fan, Timothy B., shared a post that he received for a work-from-home scam. Work-at-home and get-rich-quick schemes have been around for a long time, first appearing in people’s real mailboxes, on TV, and in magazine advertisements. Cybercrooks have created variations of this scam to harvest email addresses and contact lists from Facebook. Social networking makes it easy to create fake profiles and identities quickly. The grammatically-challenged swindler from Timothy B.’s newsfeed entices potential victims with the ease and flexibility of working from home whenever they want. The message promises big earnings, and all you need to do is make a $40 investment to find out how. This scammer will most likely try to get you to wire money and then collect your personal information. No business name or contact address - No legitimate company will advertise for jobs without stating their name, brand identity and physical contact address. You're required to pay a fee for additional information. Legitimate employers don't charge a fee to hire you or to get you started. Don't send money for directories or start-up kits. Claims that no experience is necessary or resume is required. Asks for personal information like a Social Security or bank account number over the Internet. Report the company to the Better Business Bureau (BBB) - If you have a company name or web address, use the BBB’s search tool to find out if there have been complaints filed. You can file your own complaint online.